I got a copy of Mayor Kwame M. Kilpatrick's Next Detroit report in the mail this morning. It's a 28 page document that is printed in full-color on heavy glossy paper. 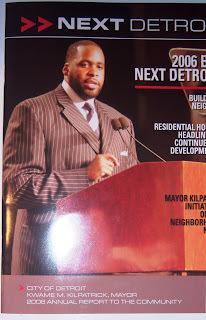 How much money did Mayor Kilpatrick spending on printing and mailing for this booklet to people? Most importantly, how many more police officers could we have hired if the Mayor didn't do it? I wonder this because every time anyone complain about a lack of police protection in our neighborhoods, the answer is always that the City of Detroit doesn't have enough money to hire any more police officers. But there always seems to be enough money for things like a 28 page full color booklet that tells me what a great job the Kilpatrick Administration is doing. This doesn't really seem like a good idea to me. First, I'm confident that even if the booklets only cost as much as 1 police officer, that officer would have accomplished a lot more than any booklet would have. Second, and more importantly, the only report that I need regarding the Kilpatrick Administration's progress in this City, is the one I get every time I look out my window. When I see one drug deal after another happening in our community, something is seriously wrong. When I call the police, only to be told that there is nothing that can be done about it, something is seriously wrong. And that is something that no booklet in the world can improve upon.